This document and specific sections are available for download as PDF files. 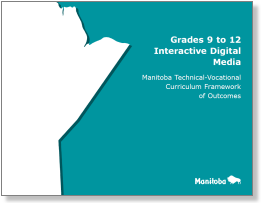 During voluntary implementation, teachers have the option of teaching the entire new draft curriculum as soon as Manitoba Education and Training releases it on the Technology Education website. They also have the option of teaching the courses from the previous curriculum. Teachers who implement courses before system-wide implementation need to ensure that students who are already taking courses from the previous curriculum achieve all SLOs with a minimum of redundancy. Voluntary implementation of all courses begins in the fall of 2015 and will continue until their respective system-wide implementation dates. Under system-wide implementation, all teachers in Manitoba teach the new curriculum and use the new course codes. Teachers will no longer be able to use the previous course codes. Course codes are found in the Subject Table Handbook: Technology Education.